SLJ got a demo of the new Google Earth, released today, April 18, at an unveiling held at New York's Whitney Museum of American Art. A new feature, Voyager, provides users of the updated application with a range of choose your adventure type experiences, created by BBC Earth, Sesame Street, and the Jane Goodall Institute, among others. 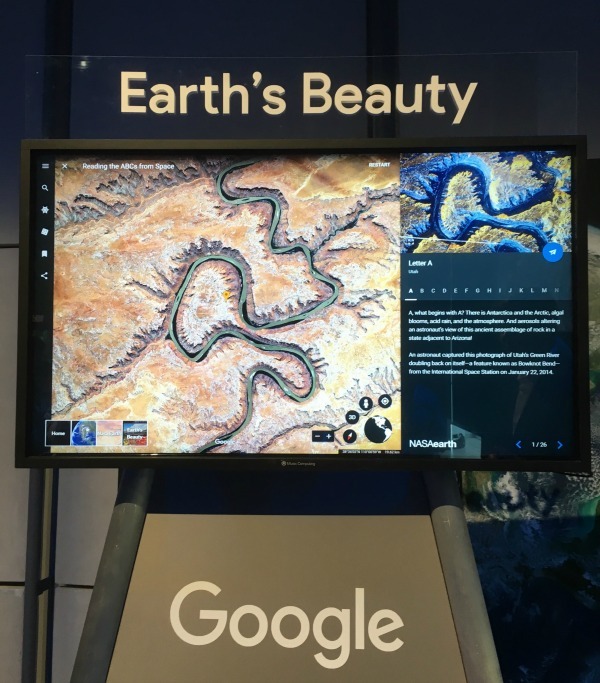 Longtime Google Earth collaborator NASA offers a visual, interactive project using land forms that recall letters of the alphabet. Pictured here is an astronaut's snapshot of Utah's Green River doubling back on itself at Bowknot Bend, representing the letter A. What is NASA planning for Earth Day (April 22)? "For us, every day is Earth Day," replied Kevin Ward, manager of NASA Earth Observatory. In addition to a dry sense of humor, Ward possesses a library degree.